The Asheville Home Builders Association is honored to have been awarded the Grand Prize from the 2018 Momentum Awards presented by Growthzone for the Playhouse Showdown Project. Through this unique program, Buncombe County students complete a themed 6′ x 8′ Playh​ouse working within specified parameters while demonstrating creativity in design and problem solving over the course of 5 months. Each of the five participating local high schools form a team comprised of students studying drafting, carpentry, interior design and marketing. Members of the Asheville Home Builders Association ​proudly donate ​all building ​materials as well as mentorship and guidance throughout the project. 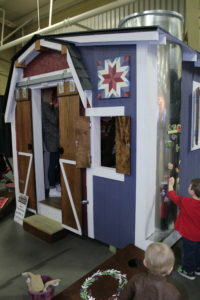 ​Finished playhomes are on display for the community to​ view at the AHBA’s Build and Remodel Expo each February. Each house is judged by a panel of licensed Builders for identifying a winner for the “Best in Show” Award and homes are also voted on by the public for identifying the “Viewer’s Choice” Award​. 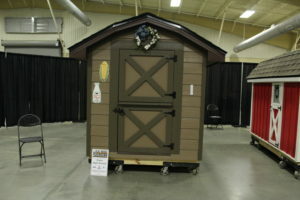 Throughout the building project as well as during the Expo, raffle tickets are sold by students and volunteers for a chance to win one of these custom playhouses. ​ All raffle ticket proceeds directly benefit Buncombe County High School’s Career and Technical Education Programs. As the home building market continues to be in high demand in the expanding Asheville Area, labor shortages for skilled craftsman have been front and center for the building industry. 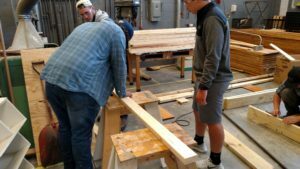 The Asheville Home Builders Association is working hard to encourage students to explore the options of pursuing rewarding career paths in the construction trades through programs such as the Playhouse Showdown Project. Through this program alone, thousands of dollars have gone directly to our local high school’s Career and Technical Education Program to help purchase supplies for the schools and build up the Construction Courses available to students. Interested in supporting the 2019 Playhouse Showdown? Visit The Playhouse Showdown Web page to learn more!